Four Ainu fishermen stand in log boats, two of them holding spears as if ready to catch fish. Fish was, together with venison and other game, a very important part of the Ainu diet. It was actually so important that in the many Ainu tales recalling famines, the cause is usually the absence of fish. The very Ainu word for fish, chep, is a contraction of chi-ep, which means food. “Coming from Japan,” one 19th century European observer wrote, “the first thing that strikes a traveller in the Ainu country is the odour of dried fish, which one can smell everywhere.” The primary catch was trout in summer, and salmon in autumn. Salmon was often called kamui chep, or divine fish. Other fish, like itou (イトウ, Japanese huchen) and ugui (ウグイ, Japanese dace), were also caught. 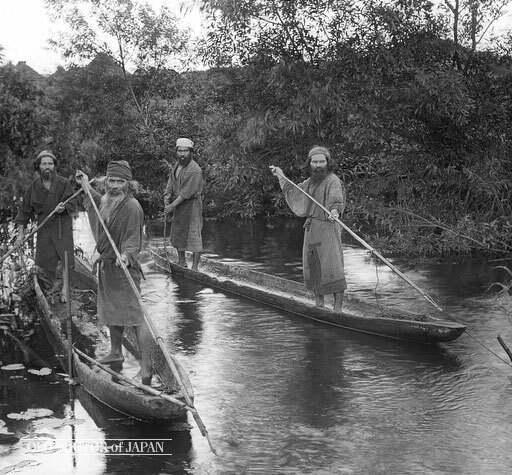 Four Ainu fishermen stand in log boats, two of them holding spears as if ready to catch fish. Fish was, together with venison and other game, a very important part of the Ainu diet. It was actually so important that in the many Ainu tales recalling famines, the cause is usually the absence of fish. The very Ainu word for fish, chep, is a contraction of chi-ep, which means food.1 “Coming from Japan,” one 19th century European observer wrote, “the first thing that strikes a traveller in the Ainu country is the odour of dried fish, which one can smell everywhere.”2 The primary catch was trout in summer, and salmon in autumn. Salmon was often called kamui chep, or divine fish. Other fish, like itou (イトウ, Japanese huchen) and ugui (ウグイ, Japanese dace), were also caught. The most common spear used by the Ainu to catch fish was the marek (マレク). The marek had a pivoting hook (1) fixed to a pole (2). After spearing the fish, Ainu fishermen would pull the string (3)—often made of sea-lion skin—to let the hook swivel down and prevent the fish from wriggling off. We were not far from the river banks when shouts and cries of excitement reached my ears. I hurried on to the water-side and saw the two “dug-outs” swiftly coming down with the strong current, parallel with each other at a distance of about seven feet apart. There were three people in each “dug-out,” viz., a woman with a paddle steering at the prow; another woman crouched up at the stern, and a man in the middle. A coarse net made of young vines, and about five feet square, was fastened to two poles seven or eight feet long. The man who stood in the centre of each canoe held one of the poles, to the upper end of which the net was attached, and attentively watched the water. Besides the marek and nets, a 70cm (2 feet) long willow stick called isapa kik ni (イサパキクニ, head-striking wood) was used. It played an extraordinary role in Ainu culture. According to Ainu legend the salmon god got angry because salmon were killed with any tool that lay handy. The god told the Ainu to pay salmon the proper respect and use the isapa kik ni. Until they did, the salmon would not return. The starving Ainu agreed and the fish were bountiful once again. Interestingly, in Landor’s description the woman used a stone to kill the fish. The Ainu used several methods to prepare and store fish. Usually, the heads of the fish were removed, after which the fish were halved along the backbone and smoked. Salmon were also air-dried on trees, or from the rafters of the Ainu’s huts. Trout, which easily spoils, were grilled and dried. After preparation, the fish were stored in storehouses called pu (プ). Game, and wild as well as cultivated vegetables were kept here, too. Salmon were not only used as food. The thick and tough skin of spawned salmon, for example, became material for making winter boots. Fish-oil in oyster shells was used for lighting. With salmon playing such a major role in the daily life of Ainu, they understandably became a significant part of Ainu spiritual life as well. So the Aino spent the night with the old chief. When next day came, the old chief spoke thus: “Some of my people, both men and women, are going to your country for purposes of trade. So, if you will be led by them, you will be able to go home. When they take you with them in the boat, you must lie down, and not look about you, but completely hide your head. If you do that, you may return. If you look, my people will be angry. Mind you do not look.” Thus spoke the old chief. Unfortunately, the traditional Ainu subsistence economy, which was completely based on living off the land and barter, was disrupted when Japan’s economy underwent enormous growth during the Meiji Period (1868-1912). Hokkaido possessed great natural resources and the Japanese government actively promoted the colonization of the northern islands. All over Hokkaido, mines, factories and fishing ports were constructed. Ancient forests were replaced by farms. Industrialized fishing fleets used huge nets to fish the seas surrounding Hokkaido. New laws were enacted that restricted Ainu fishermen to specific days and locations and even the number of salmon they were allowed to catch. Hunting was outlawed and Ainu could not even cut a tree anymore without being arrested as criminals. Even the Ainu language was outlawed. Many Ainu were often forcibly removed. Those that were not, starved because of the loss of their hunting and fishing grounds. Not surprisingly, Ainu culture went into a desperate decline. It would take until the end of the 20th century, more than a century later, that a revival of Ainu culture was possible again. Finally, in 2006, the Japanese government implemented a project to recreate traditional Ainu living spaces (iwor) in Hokkaido.6 Young Ainu are once more learning their ancestor’s language, and many programs have been set up to create more awareness of the Ainu culture. Once again, young Ainu are proud of their heritage, and there is hope for the future. See all photos of Ainu. 1 Refsing, Kirsten (2002). Early European Writings on Ainu Culture: Religion and Folklore. Routledge, 519. ISBN 0700714863. 2 Landor, Arnold Henry Savage (2001). Alone with the Hairy Ainu or, 3,800 Miles on a Pack Saddle in Yezo and a Cruise to the Kurile Islands. Facsimile reprint of the 1893 edition by John Murray, London. Adamant Media Corporation, 5. ISBN 9781402172656. 4 Refsing, Kirsten (2002). Early European Writings on Ainu Culture: Religion and Folklore. Routledge, 521-522. ISBN 0700714863. 5 Chamberlain, Basil Hall (1888). Aino Folk-Tales. Folk-Lore Society, xxxiv. 6 Ainu Assocoation of Hokkaido, Ainu Historical Events (Outline).